“Caja de Muerto” Island (Coffin Island) is located in southern Puerto Rico off the coast of Ponce (only 8 miles away). This island is only 1/2 mile in width (at the widest part) and 1 1/2 miles in length. It offers many things such as a lighthouse, an old hidden pirate cave, hiking trails, and gorgeous beaches. 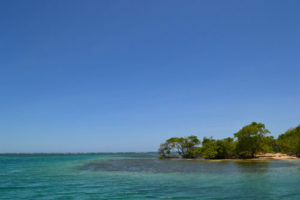 The whole island is also a well-protected natural reserve. Many believe that it got its name because it resembles someone lying down as in a coffin when seen from a distance. Others believe its name derives from a legendary coffin found inside the island’s cave. The hiking trails on the island take you among other places to the old lighthouse, which has a wonderful platform for a perfect view of the island. This platform is located right on top of the Almeida Cave. You cannot go inside the lighthouse, but the trek to the platform is well worth the view. The legend that surrounds this island has to do with a pirate named Jose Almeida. He once fell in love with a Basque lady when he visited Curacao. He married her and took her to sea, where she, sadly, was killed. He buried her in the cave mentioned above and visited her each year to leave some of his new treasure with her. When her coffin was found many years later, the island became known as Coffin Island. The beaches on this island are idyllic. The Pelican Beach has the designation of a Blue Flag Beach. This means that authorities monitor the ocean water and the beach has paramedics or guards watching over the area. Pelican Beach also has restroom facilities in the form of composting toilets. Some of the beaches located on the eastern side of the island are blocked off from the public when giant turtles are nesting. These beaches are not ideal to swim at for the most part because of the rough seas. This island offers no fresh drinking water, so travelers must pack their own with whatever food, chairs and other items you will need for your day there. Also, visitors need to pack all their trash out upon leaving. Our deluxe Coffin Island tour is provided by our partner tour operator company called Aqua Adventure. 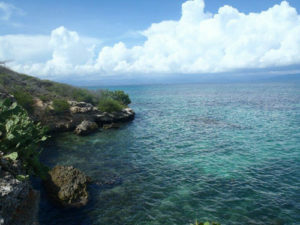 Our snorkeling/hiking day trip departs from Ponce. Once on board, you are be in the hands of experienced guides, hosts, and even a biologist on board in addition to your Vamonos guides. Expect unlimited snacks, beverages, and lunch. Our tour usually starts with a walking tour/hike of the island followed by some beach time, lunch, and snorkeling. On our guided island exploration we’ll hike numerous trails and learn about the rocky terrain, the many cacti along the way, a few fun creatures, and the limestone rocks. We’ll also visit an old lighthouse from 1887, and tour the legendary cave. We may also stop by the island’s tiny flora and fauna educational museum. During our beach time we’ll get some lessons on snorkeling as we prepare to snorkel the coral reef underwater trail. This trail contains underwater signs about the region’s fishes and plants. Expect to see plenty of sea creatures like sea turtles, colorful fish swimming amongst the coral, stingrays, and even an underwater dolphin statue. This deluxe adventure is for groups of 15 or more and includes all the necessary snorkeling equipment, transportation to and from the island, tour guides, snacks, and necessary permits to enter the island. Please contact us for more details.If your group is 15 or less, contact Island adventure at 787-842-8546. Caja de Muerto Island is a very secluded natural treasure visited by few travelers and ready to amaze you.